Serious loss is something we will all experience at some point of time in our lives. This may be because of the death of a loved one or it may be circumstances such as miscarriage or loss of a job. Sometimes we do not experience loss or bereavement until later in life and have had some opportunity to learn about death and how people are affected by grief. However, whenever we experience loss or bereavement, we often do not know ‘how to grieve’ or how we should respond to our loss. Bereavement or loss is a difficult journey. 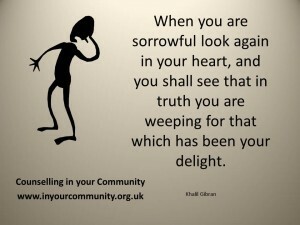 When we see other people who are facing a loss or bereavement, it is common to think they are coping and yet when it happens to us, it can feel as though we are not coping. In fact it can feel that we are the only the person who has ever felt the way we do. Coping with loss is an individual experience and there is no right or wrong way to dealing with it. However, they are a few common experiences that people may share. The most common feeling after a loss or death of someone is shock. Along with it you may feel numb, panicky, very weepy or unable to cry at all. Some people have major physical symptoms such as heart palpitations and cannot sleep whereas other people can stay calm yet appearing as though they do not care. All these feelings are intermingled with depression, tiredness, weepiness and low mood. This may lead to people thinking there is no point going on and often go over what they could have done differently to stop the loss or death of a person. This then often can turn to anger, especially with death. The anger can be directed at the person who has died or those around you. Coming to terms with a death or loss takes time and is a gradual process. Do not rush it. Often people talk about it taking 1 or 2 years before they are slowly able to get on with their life and not be consumed all the time with thinking of the person they have lost. Look after yourself. Pay attention to your health and diet. Often when people are grieving they find it hard to eat and take care of them self. However, this can lead to further problems. Try to eat regular meals and take regular exercise. Do not make major changes in your life, such as moving house or changing house. Give yourself time to adjust to your loss and do not make a change you may regret later. Talk to people. It is important for you to understand your loss and accept your loss. Talking with friends, family or a professional, such as a counsellor, will help. Keep up with friends. Accept invitations and keep in touch with your family and friends. Don’t isolate yourself. If you feel lonely, maybe look for local bereavement or loss support groups. Don’t use alcohol as a crutch. Alcohol is a depressant and will not help your low mood. Plan for the anniversaries, birthdays, Christmas etc. Often the lead up to an anniversary is more difficult than the day itself. It is important to plan ahead on how and who you would like to spend this emotional day. To find out how friends can be compassionate friends to help someone who is experiencing loss, look here. If you wish further help by counselling then Hazel can provide support to via counselling in Sheffield or via online counselling. Contact her on 07814 363855.